On October 16, British heavy metal legends SAXON will release their 21st studio album, "Battering Ram", in North America via UDR Music. On "Battering Ram" — with Biff Byford singing as well as he ever has, Paul Quinn and Doug Scarratt making full use of the term "shredding" with their guitars and the lock-steady rhythm of Nibbs Carter's bass and Nigel Glockler's drums — the future and the past crash together in an ear-scintillatingly engaging, raucous, melodic-yet-classically heavy ten-song collection which will instantly be hailed as a SAXON classic. 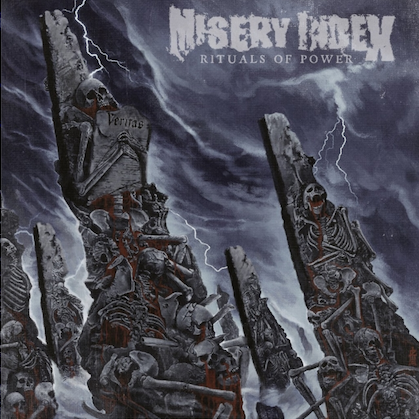 The title track, with its delectable twin guitar assault heralding the album's commencement, gives the listener an instant crack around the chops, whilst traditionalists will be delighted to hear such a perfect marriage of old, classic SAXON with the newer, fresher invective in such riff-fronted fare as "Destroyer" and "Stand Your Ground", but there are still moments of space and exploration which fans will love. 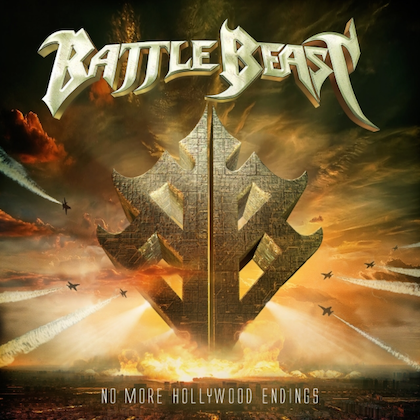 "This one's a natural progression from 'Sacrifice'," says Byford, "There's a bit less rock 'n' roll and a bit more 'heavy' on it. We wanted to keep focused on a style rather than moving around too much." 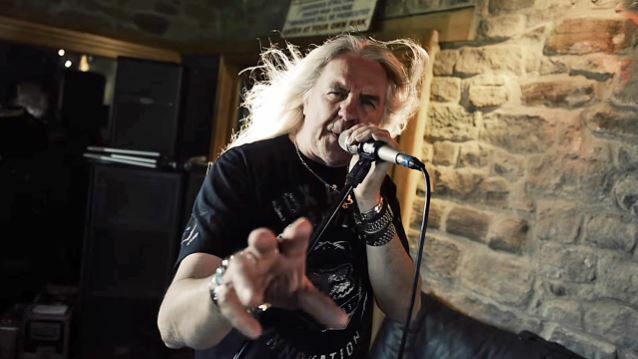 Produced by Andy Sneap (MEGADETH, TESTAMENT, EXODUS, ACCEPT) at his Backstage Recording Studios in rural Derbyshire, SAXON were able to hone in and whittle down any excess, finding the sonic space and balance to let "Battering Ram"'s riffs and melodies get the necessary space to scream front and center, Sneap bringing a crispness to the sound which evokes memories of the early '80s without for one moment sounding dated. "Yes, Andy has been in charge of everything with this album, I keep on overview of it all, but he's done a great job and we're both pleased with the results. We have a great partnership," adds Byford. Lyrically, "Battering Ram" covers a variety of social situations, like the screaming fans who rage at the gig barriers ("Battering Ram") or engaging in some good old fashioned myth ("The Devil's Footprint" — a 200-year-old tale of people waking up in winter snowfall to see unexplained hoof prints which they followed, looking for an answer in vain). "When I'm writing lyrics I like to switch back and forth between complex things, reality and rock'n'roll," says Byford, "I thought the whole folklore behind 'The Devil's Footprint' made it great material for a metal song, being that it's both historic and mythical. "With 'Queen of Hearts', I wanted to write something around Lewis Carroll's 'Alice In Wonderland', and it's about the chess game that happens in the story. I wanted it to have prog-feeling in the way of its ambiance and mood. Then you have songs like 'Destroyer' and 'Hard And Fast' which are '80s-inspired songs with that modern slant on it. I'm a big fan of Marvel comics, and I wanted to write a song around the character Destroyer, and with 'Hard and Fast', it's, as the title suggests, about driving fast! I do like to tie the lyric into the song, so if it's going to be a song about driving fast, well, it has to be a fast, hard song!" There is also the album's closing cut, haunting, gripping, melancholic tale of the First World War, "The Kingdom Of The Cross", where a poem unfurls the feelings and horrors which comprised this most brutal of global conflicts. "This year is the centenary of the end of the First World War. Nigel had a piece of music which he played on a synthesizer for a couple of years that I really liked. We had an actor (and singer), David Bower from the band HELL, read the poem and I sang the choruses. I didn't want it to be typical SAXON, so it is just keyboards, bass, me and Dave." The official video for the CD's title track can be seen below. In this no-nonsense, sharp clip, Biff and the boys are captured at Backstage Studios in Derbyshire, U.K, throwing down a thunderous performance. "Battering Ram" is available for pre-order now via iTunes, with "Battering Ram" as the instant grat track. 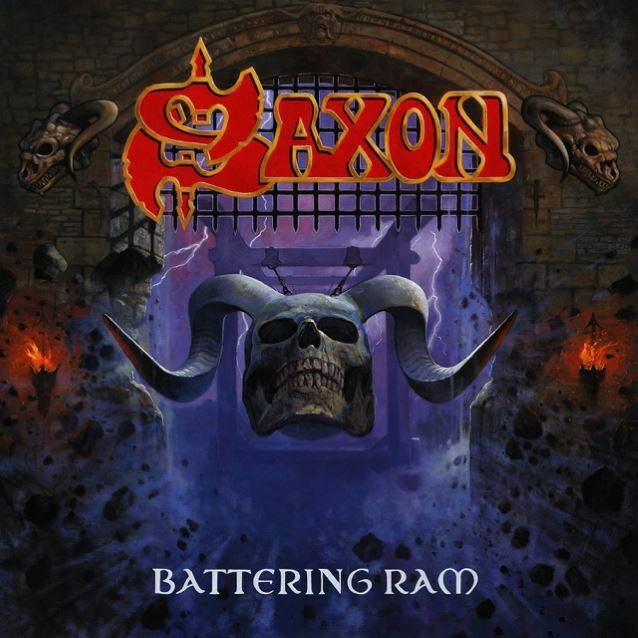 Coming soon, "Battering Ram" will be available for pre-order via Amazon and various formats will include CD in ecolbook, 180 gram vinyl, limited edition boxset (containing CD, vinyl and a bonus CD with the band performance of their "Denim & Leather" tour "Saxon Over Sweden 2011", featuring 18 tracks). In celebration of the release of "Battering Ram", SAXON will play select dates with MOTÖRHEAD, and others with ARMORED SAINT, in the U.S. beginning August 19.